Marneus Augustus Calgar, Chapter Master of the Ultramarines, must survive the siege of Zalathras if he is to defeat the greenskin hordes of Warlord Brug. Paul Kearney is a widely published genre author who has been long-listed for the British Fantasy Award. 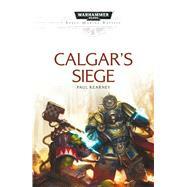 For Black Library, he has written the Space Marine Battles novel Calgar’s Siege, as well as the short story 'The Last Detail' from Space Marines: The Omnibus. He currently lives and works in Port Glenone, Northern Ireland.